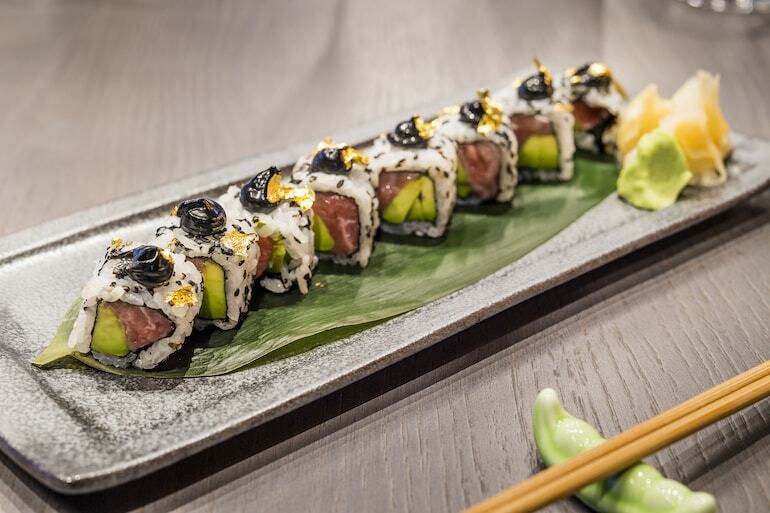 We ventured down to Vauxhall to check out what Japanese-fusion restaurant Four Degree has to offer and it's safe to say we were not disappointed. 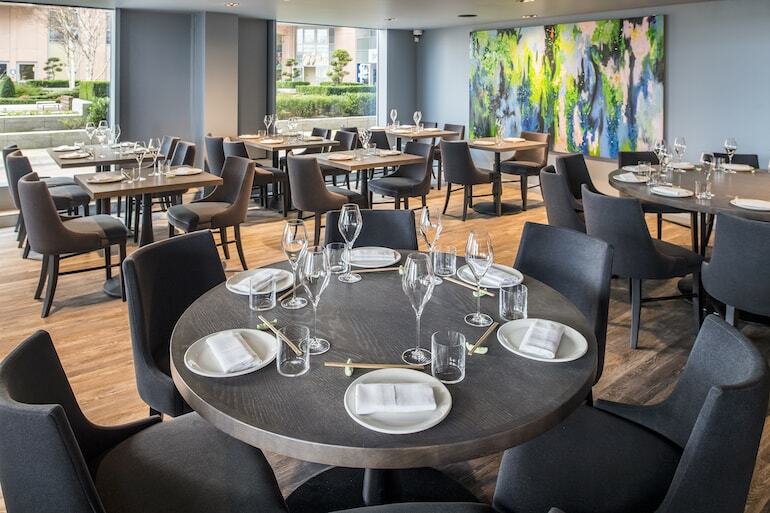 Located at the up and coming St. George Wharf, the restaurant has stretching views of the River Thames and one of the best menus this side of the river. When looking for a new place to eat, you might not immediately think of Vauxhall. 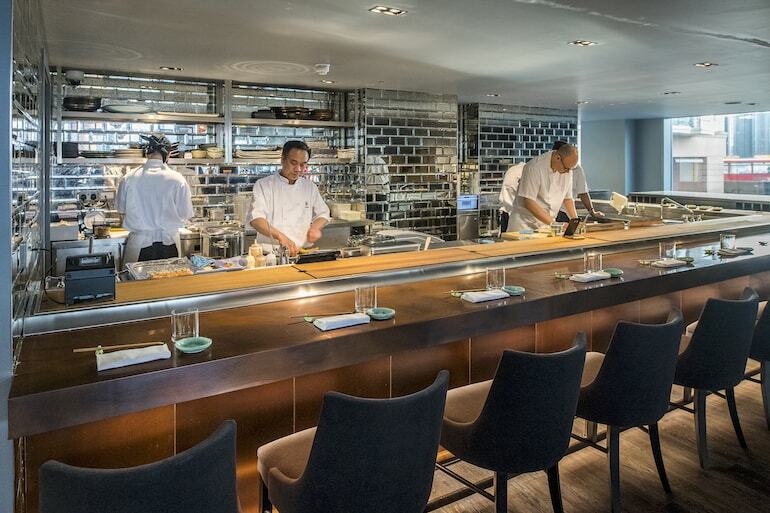 If you don't then you probably have discovered the somewhat secret gem that is St. George's Wharf, where you'll find one of London's best new restaurants, Four Degree. St. George's Wharf is an up and coming area situated right on the River Thames just near Vauxhall station and the affluent Embassy Gardens. It will soon become home to an array of some of London's finer restaurants and Four Degree is leading the way. 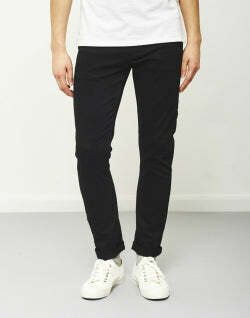 Four Degree has been open since early December and is quickly becoming one of the capital's hotspots. 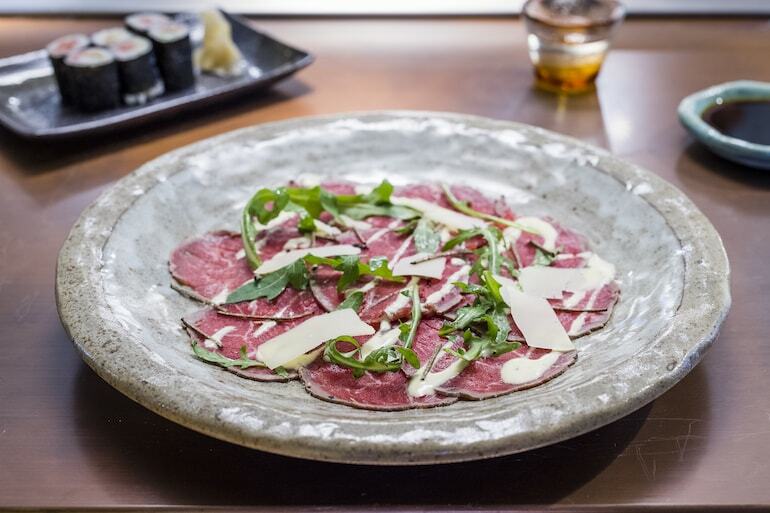 It is a fusion of Japanese and European cuisine and its head chef Kyoichi Kai serves up a range of dishes, featuring some of the best seafood, meat and vegetables dishes you can expect to find in London. Kai has an acclaimed background in cooking and has worked at some of London's best restaurants, including the likes of Zuma and Kyubi. The menu boasts an exquisite array of tastes and fusions, which we can guarantee you won't be able to find anywhere else in London. Four Degree is split over two levels and has views of Battersea Power Station and the north bank of the River Thames. Situated in the middle of the restaurant is the venue's impressive cocktail bar, which serves up a whole range of drinks with a Japanese twist (we had a pretty excellent gin and tonic made with a Japanese gin). Eating at Four Degree isn't just about the food, but the overall service. It is a dining experience like no other and you can expect the very best. The bartenders will be on hand to give you the very best cocktails, using their wide knowledge to give you something that they know will suit your taste. Food-wise the staff know the menu like the back of their hand, which you may think should be a given, but you'd be surprised by how many restaurants we go to and don't get this kind of treatment. When we came down to Four Degree we wanted to really make the most of the extensive menu, which is no easy feat as it is one large selection. We decided to start with a few nibbles while we waited for our cocktails to be made (an interesting take on a classic martini). We went for chicken kara-age which is deep fried chicken with a lemon marinade and a dish of spicy edamame - nothing too heavy and not too filling as we knew we had a lot more to come and enjoy. Next we decided which things we really wanted to try on the menu and, of course, we just had to get our hands on and teeth into the wagyu sirloin steak in a ponzu sauce and lobster in tarragon sauce. The wagyu was one of the best cuts of meat we've ever had and it quite literally melted in the mouth. As lobster goes, the one on offer at Four Degree was one of the freshest we've ever encountered in London and really has raised our expectations from now on. While side dishes typically are pretty nondescript, at Four Degree we decided to go for two of the small plates. A warm mushroom salad was surprisingly the standout star of the whole dinner - black truffle shitake, eringi, shimeji, champignons de paris, shallots & parsley with ponzu dressing. Delicious! We also went for a seaweed salad which was a perfect accompaniment to the richness of the wagyu and lobster - fresh and light, while still being completely flavoursome. We couldn't leave Four Degree without trying some of the sushi and sashimi on offer. We had previously been recommended the Four Degree roll which consisted of rice covered salmon with a truffle cream. Alongside this we thought it best to try one of the sashimi platters - Nozomi consisted of raw cuts of salmon, tuna and yellow tail. While this may sound like a lot of food, it definitely didn't leave us feeling overly stuffed or sick, which is always a plus when leaving a restaurant. That said, we definitely had a little room for a dessert and again based on recommendation we went for the banana miso - layered caramel miso sauce with black crumble and a banana ice cream. A perfect way to end an outstanding meal. With Valentine's Day just around the corner, we throughly recommend Four Degree. With it's ambient atmosphere and lowly dimmed lights, it's the perfect place to enjoy a quiet and romantic evening. Add to this an excellent menu which showcases the best that the restaurant has to offer at just £85 per person, you'd be silly not to come here. The menu consists of a drink titled Love Potion No. Four, followed by a selection of dishes such as pepper mousse with tomato coulis, foie-gras teriyaki, assorted sashimi, roasted duck breast in a ginger sauce, Yuzu sorbet and grilled Scottish filet & sea urchin ponzu. Four Degree is one of the nicest places we've been to this side of the new year and we definitely think that you should make a little effort when visiting. 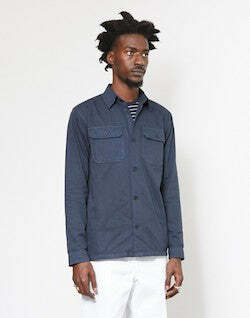 Nothing too fancy, but definitely go for a shirt and leave any hats at home. 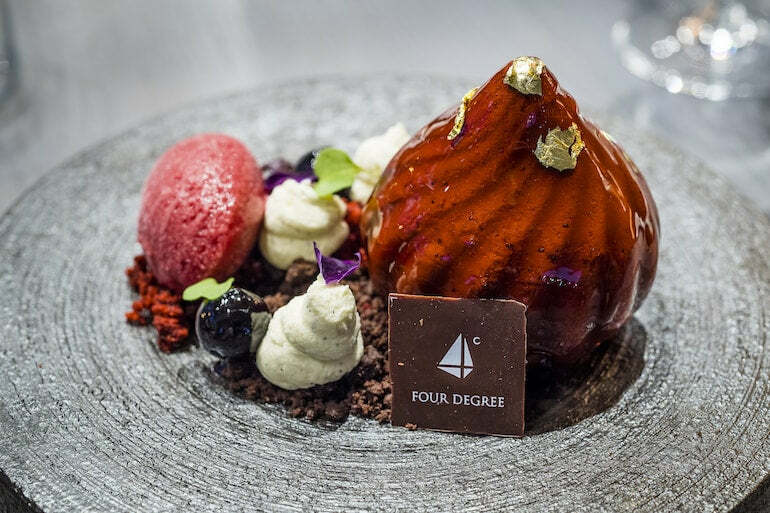 If you're looking for somewhere new to eat over the next coming months, we definitely recommend Four Degree. It is one of the gems of Vauxhall and we reckon it will soon be heralded as one of London's best restaurants. Watch this space.